I was in NYC last week partially for play, partially for work. Even though my birth certificate says New York, New York, I am not one of those people who loves New York. This is not to say that I don’t enjoy it and that there definitely aren’t parts of it that I wish I could transplant to the Chi or that I wouldn’t even consider living there one day, but when people find out that I spent every summer and holiday there and that most of my extended family still lives there, the reaction is always, “don’t you just love New York? How can you not live there?? ?” It’s hard to explain that I’ve gotten used to the pace of Chicago, the simplicity, the ease of it, but it’s even harder to explain that being there is always a little bittersweet, because everything from the airport to the subway to the pretzel stands to just about every corner of Midtown (and a few in the Bronx, Queens, Long Island and Brooklyn) is part of a memory of a family that is close to existing only in my mind. Our times in New York were filled with so much fun and laughter that it seems impossible that any new times in the city would ever truly compare. It sounds absolutely bizarre, but even amid the tourists and the traffic and the noise and the people rushing past me, I can get so caught up in remembering some moment walking down 57th street with my grandfather or waiting on the #4 train platform with my dad that I find myself just standing still in the middle of the sidewalk trying to catch my breath. And if you’ve ever wondered what it sounds like to have what feels like 5,000 people scream at you at once, I highly recommend stopping dead on a sidewalk in Manhattan at rush hour. Good times. Before I get way too caught up in family history, I’ll tell you what may actually be the real reason I waiver on moving to the East Coast: the weather. Yeah, yeah, I know, I live in Chicago and it’s cold and windy and blah blah blah. But, y’all, the East Coast is extreme. For real. I had never seen as much snow as I did when I went to school in Poughkeepsie, which is just 1.5 hours by train from NYC. I mean, it was up to our hips from January until April (for all of you wondering, it is too cold in Chicago to snow that much. I’m not saying cold is better than snow, it’s just what I’m used to). And summer in New York? Fuggedabouit. The Chi may be hot and humid, but at least we have a bit of lake breeze to cool us off. I spent many an NY summer trying to stay as still as possible. And right now, as we are 6 weeks away from the official start of winter, I’m reading post after facebook post about how my New York friends are digging out from snow! In October! It’s a balmy 54 degrees and sunny in Chicago (although with the windchill it is 48. Just trying to keep it honest). Anyhoo. 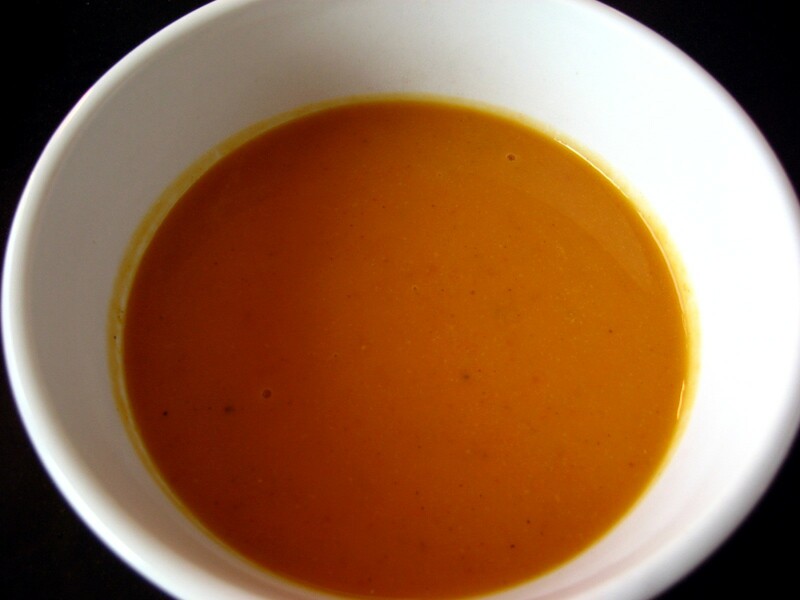 One friend posted a picture of her deck covered in snow and said that she wanted soup, and I realized that I had a pumpkin soup recipe that had, like so many others, been waiting for a good story. 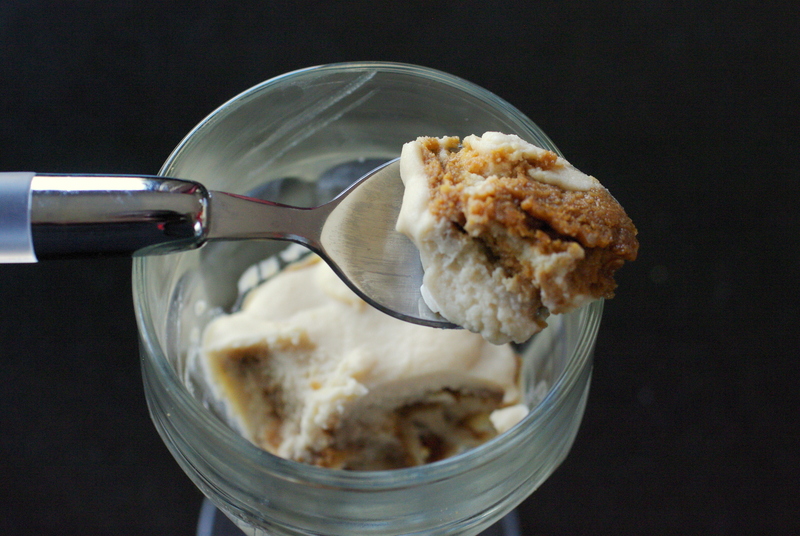 I recognize that I haven’t necessarily provided that, but at least I’m posting a holiday specific recipe in time for you to make it before Halloween and, if you’re on the East Coast, at least I have something to keep you toasty over this cold weekend. Baby steps, friends, baby steps. I love the kick that the curry adds, plus it complements the pumpkin in a way that is surprising given every other pumpkin-ish dish is sweet. I think milk would be a fine substitute for the cream and do not feel a shred of guilt over using canned pumpkin. Also, this could be totally vegetarian if you use vegetable stock/broth instead of chicken stock. The croutons are left over no knead bread, also an excellent way to heat up the house on a chilly day. Stay warm, New Yorkers! 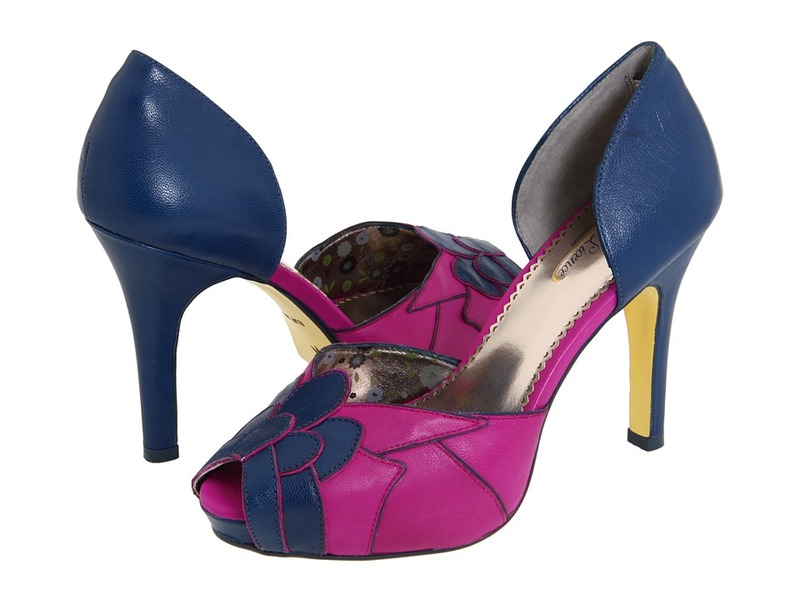 My heart may belong to the Second City, but you know I’ll always have a huge crush on you…. 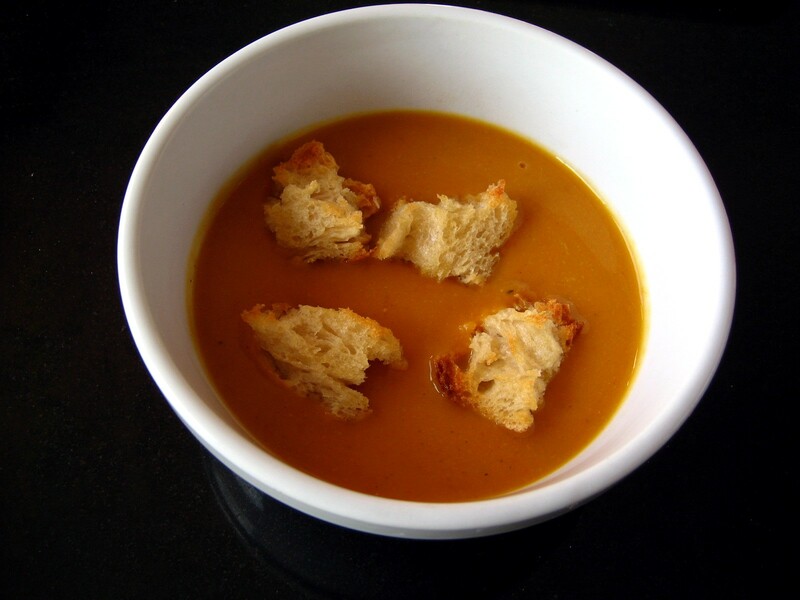 Curried Pumpkin Soup, from The Complete Book of Soups and Stews by Bernard Clayton, Jr. Melt butter in medium (3 quart) saucepan over medium heat. Add the onion and garlic, cover and cook until soft and translucent, about 8 minutes. Add the pumpkin puree and stock. Stir well to mix. Add bay leaf, sugar, curry powder and nutmeg. Bring to a boil, lower to simmer and cook for 30 minutes. While soup is cooking, taste for seasoning. Add salt and pepper as needed. Remove from heat and add cream (I’d temper the cream a bit–add a few tablespoons to 1/3 cup of soup slowly to the cream, just to bring the cream up in temperature. When you add the cream to the soup it won’t curdle). Return to heat only to bring temperature of the soup back to hot. Do not allow to simmer–rising steam only. Serve in hot soup bowls. You know that I always try to have a little backstory to go along with a recipe, because I think that it’s much more fun to find out why someone cooks or bakes something than just read a recipe, which you can do on any cooking site. A lot of times, though, I have no good tale after I try a recipe, but I really want to share it and so I wander around trying to fit the recipe into a story, any story, so I can write about it. 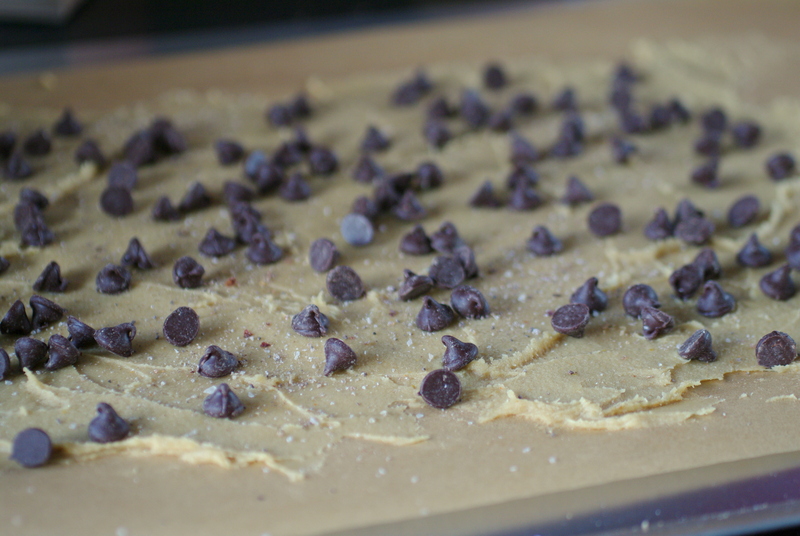 I mean, I’m not crazy (or committed) enough to go do something just so I can post about it and give you a recipe, but I do have a backlog of tasty treats that are hanging out just waiting for the right moment. This is not one of those moments. The true story is that I bought a quart of buttermilk (seriously, who needs a quart of buttermilk?) in order to make sweet potato muffins for a brunch. Since the recipe only calls for 1/3 cup of buttermilk I had a full container when I was done. I was thrilled when the lemon poppyseed cake called for a cup; I thought I could at least put a dent in the quart. But it’s obvious that buttermilk regenerates, because I swear that the carton was as full as when I started (and I made three of those cakes). So as the expiration date approached, I started thinking about what else I could do. Biscuits were the first thing that popped into my mind, but I dismissed them because I’m not a fan. 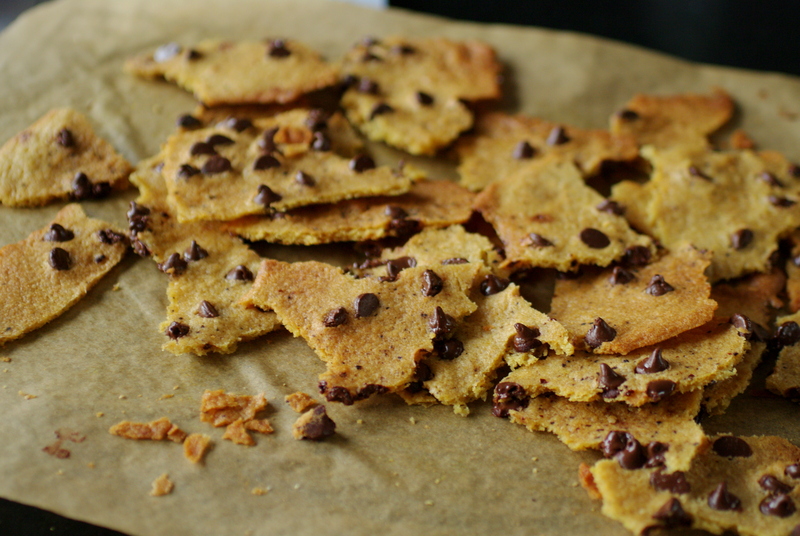 The ones I’ve had have always been heavy and chewy and too buttermilky–the tang of buttermilk is overpowering to me. But I couldn’t find any recipes other than cakes and pancakes, so biscuits won by default. 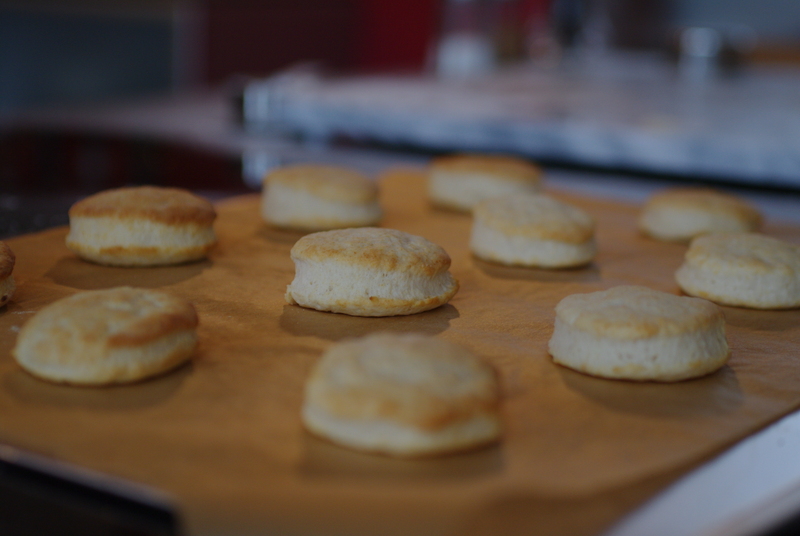 Having never eaten a biscuit that I actually liked, I had every intention of just making them, taking a few pictures and pawning them off on my coworkers. 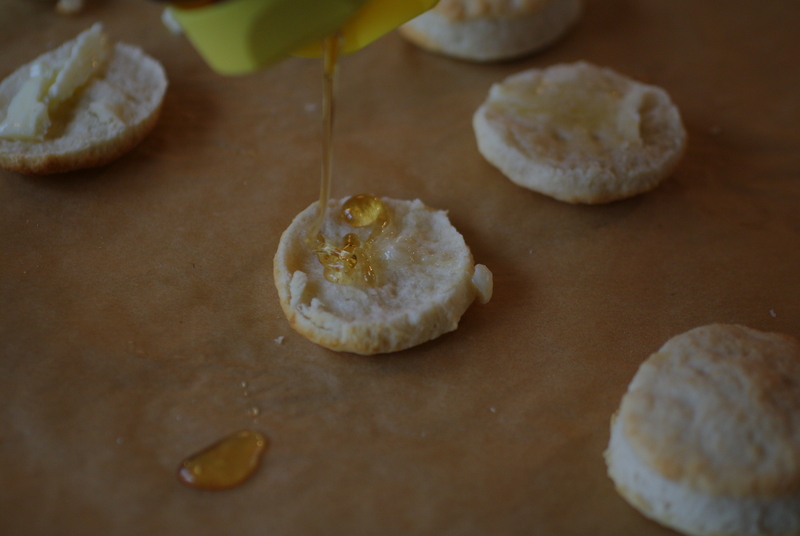 What really ended up happening is that I was late for work, because I was standing in my kitchen eating biscuits dripping with butter and honey like it was my job. I moved from the “I’ll pass” camp to the “you’ll pass over all the biscuits now if you know what’s good for you” camp in less time than it took for them to cool. They were light and layered and had a bit of sweetness (even without the honey) that balanced out the tartness of the buttermilk. Even the next day they were soft and had none of that chewiness that I think plagues other biscuits. Of course, I wouldn’t really know how they hold up for too many days, because there weren’t any left after day two. But, you know what was still hanging around? 1/2 a quart of buttermilk. I kid you not. Preheat the oven to 450 degrees and grease a baking sheet or cast-iron skillet. Mix together the flour, baking powder, sugar and salt. Cut the stick of butter into pieces and work it into the flour mixture with your hands or pastry blender until it resembles pea-size crumbs. Add the half-and-half or buttermilk, mixing until the dough is a bit loose and sticky. 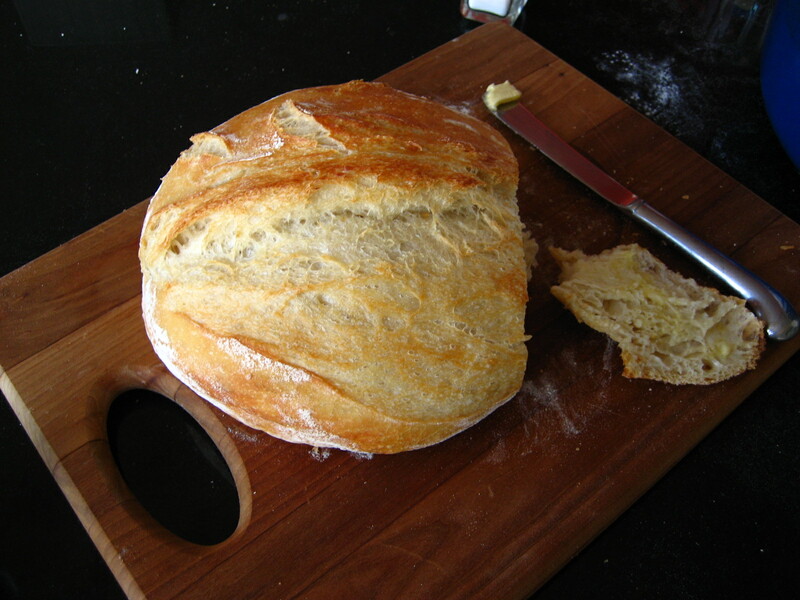 Pour the dough out onto a floured surface and knead for a minute. 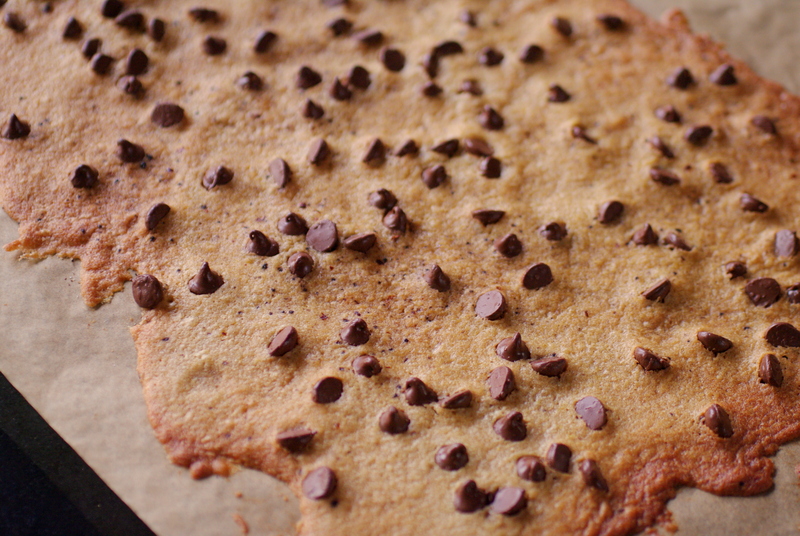 Dough should be smooth and no longer wet. You can sprinkle more flour on the surface if you find it’s sticking. Make the dough into a ball and hit it with a rolling pin, turning it and folding it in half every few whacks. Do this for a couple of minutes (I actually just picked up the dough and threw it down over and over (fold over before throwing it down again). Good tension release and upper arm workout). 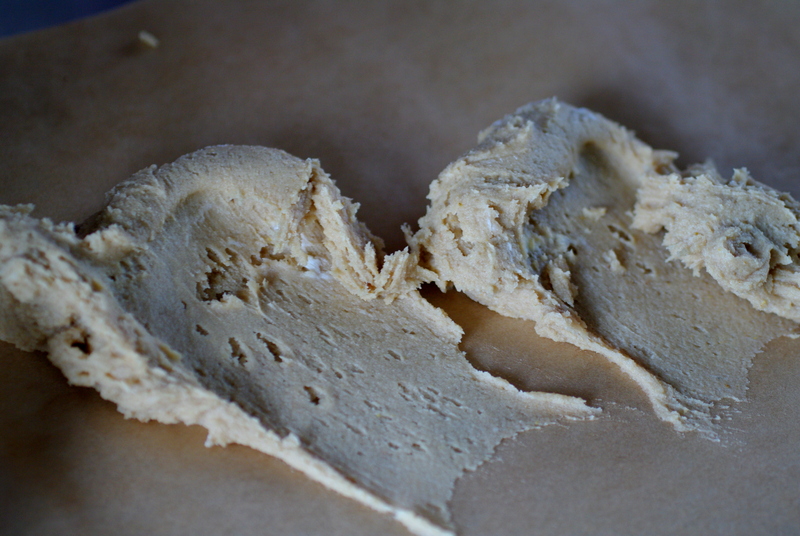 Roll out the dough until it’s 1/4 of an inch thick, then fold it in half. 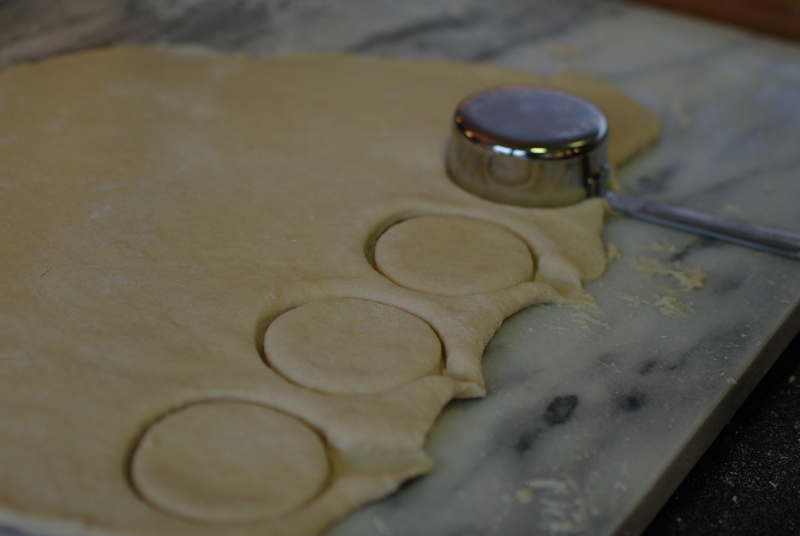 Using a round biscuit cutter (you can use a glass or a cup if you don’t have a biscuit cutter–I used a measuring cup), cut out the biscuits from the folded dough. Place on a greased baking sheet or in a cast-iron skillet close together, about 1/8 of an inch apart (so they rise up not out), and bake for 15 minutes or until the tops are golden brown. 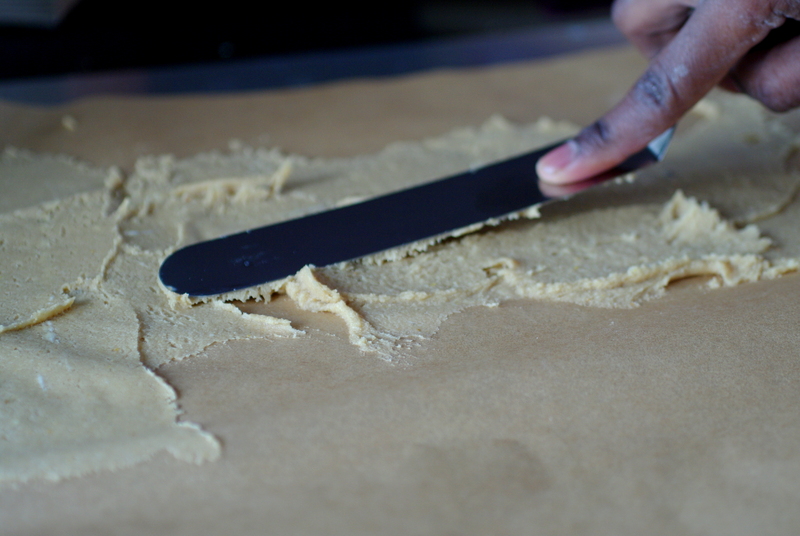 NOTE: If you don’t want to roll and cut them out, after kneading and beating the dough you can drop the dough onto the baking sheet with a spoon. 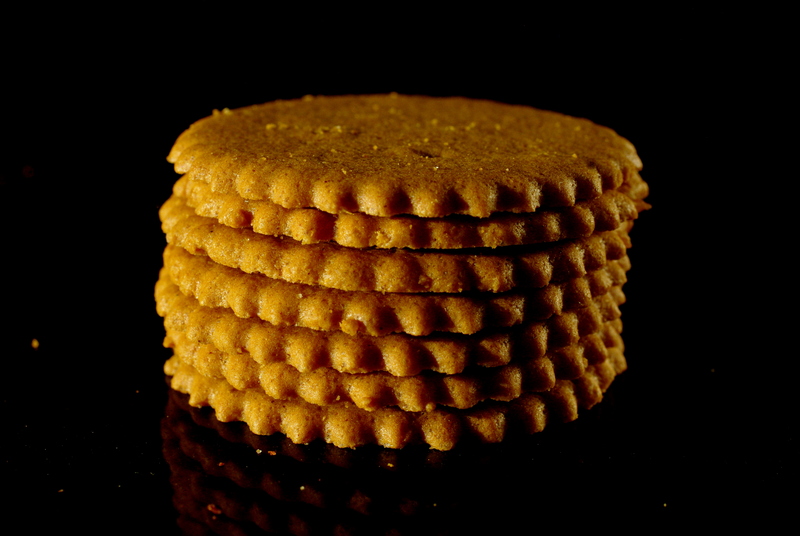 They’re not as symmetrical (dropped biscuits are also known as cat-head biscuits), but they’re no less delicious. When I was little, I used to spend my summers with my grandparents in New York getting spoiled rotten and loving every second of it. My grandmother and I would build our day around chores, cooking and watching soap operas. Our favorite was As the World Turns; we were hooked and made no apologies for it. Over the summer they brought in teen plot lines, and even though I was nowhere near being a teen, I knew a good tale when I saw it. I never watched during the school year, but when I’d return to New York the following June, there my TV friends would be, almost exactly where I left them, with perhaps a day or two—a week, at best—having passed in their fairy tale lives. Within a day, I would be fully caught up and I’d settle in as though I hadn’t been gone for 9 months. Hopefully you see where this is going (I really hope you do, because my train of thought has gotten derailed a bit as I’ve travelled down memory lane…). I know I haven’t been around and that you’ve all gone on with your lives, but I hope you’ll play a little soap opera time warp game with me and pretend that only a day or two has passed since we last talked food and fun. So. Where were we? Yes! I was traipsing around the globe, feeling very adventurous and worldly. My last trip before summer was to Ireland for a wedding. Now let’s pause here to say that there is a backstory to me flying to Ireland for 72 hours to go to the wedding of a man I met once (on St. Patrick’s Day!) located in a town that was 7 miles from the edge of nowhere. While that story, in retrospect, is somewhat as fraught with drama and tension as a plot line on The Young and the Restless, to tell it would take us on the kind of detour that we’d need a bottle of Maker’s Mark to navigate, so let’s just get to the food. I found myself in County Westmeath on a misty Friday afternoon at a lovely old mansion overlooking mile after mile of greenery (I was slightly disappointed that there was nary a field of heather, nor could anyone tell me where I could see one, but there you have it). At any rate, the first best surprise of the event was that after the ceremony we were all ushered into a beautiful atrium where they were serving tea and scones! Like in actual tea cups and with bowls of clotted cream and everything. 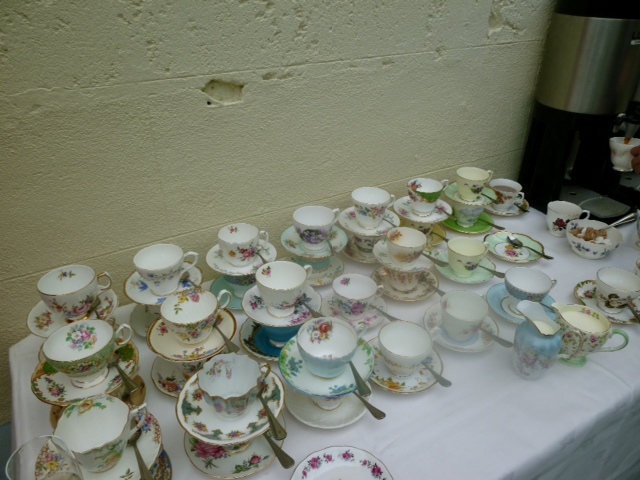 I found this to be the most charming thing I’d ever seen, especially at a wedding, to the point that I made a fool of myself taking pictures of teacups and plates (the good thing about being the only American somewhere is that you always have an excuse for borderline behavior. “Oh, that random girl that none of us know who’s taking pictures of cups? She’s AMERICAN… [wink wink].”). The second best surprise was the wedding cake. I have come to expect disappointment when it comes to wedding cakes, because they tend to be all looks and no taste. This seems unfair to all involved since most likely we, as guests, have gone through every minutiae of wedding details with the couple, including the tasting, and then we don’t get anything remotely resembling the deliciousness we were promised (not that I go to weddings for the food. Ahem). Much to my happiness, though, there was a lemon poppyseed cake which, again, upped the charm factor of this wedding. 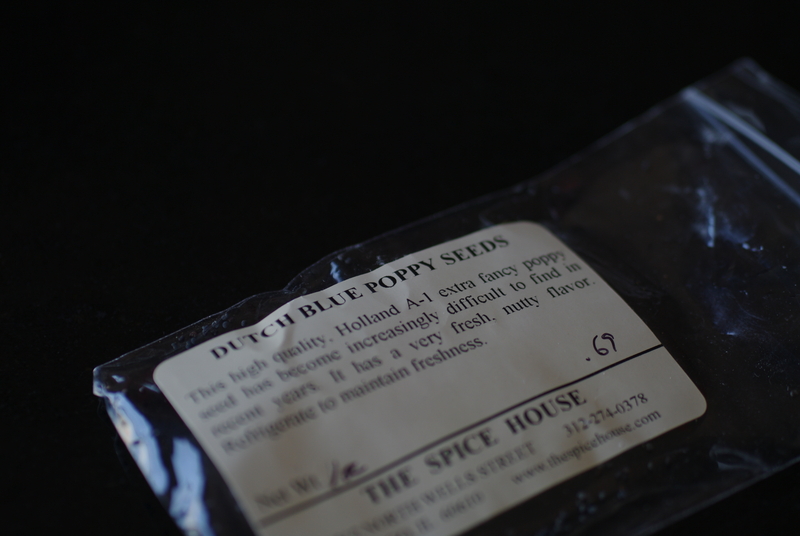 It was a bold move; poppyseeds are not the fan favorite anywhere (I don’t think…?) and with a pound cake consistency, it had the potential to be dense. But, as one of my dinner companions said, the cake was “gorgeous.” I’d never in my life heard someone describe the taste of food as gorgeous before and that–along with the jet lag and Jameson’s–just about knocked me off my chair. I wanted to recreate that cake long before I even finished eating it, but it took another two months before I got it together to make one for a friend’s birthday. She’d requested a fruit filling, so I found a recipe for a berry compote that I decided I’d put in between the layers of cake and on top. Gorgeous, isn’t it? Yeah, that’s just about where the gorgeousness ends,unfortunately. 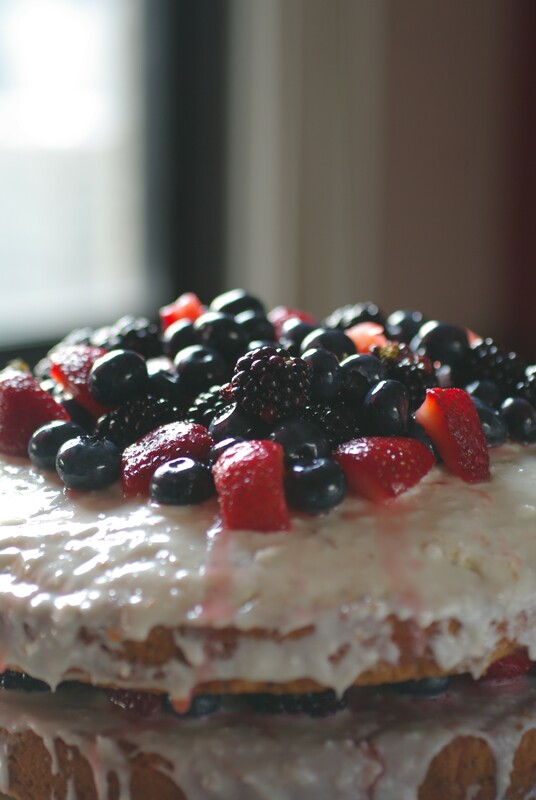 While the berries were tasty (it’d never occurred to me to use thyme with fruit), the cake was dry and had so little flavor it was almost a crime against lemon cakes everywhere. I was disappointed, not only because I’d baked it for a friend, but because I’d really wanted to bring that bit of Ireland back with me. The trip, like the cake, was so unexpected and lovely and just right, that to be able to return to the magic of that time just by whipping up a dessert would have been glorious. But, the cake didn’t work, literally or figuratively (and I realize that was a lot of pressure on a little baked good (and a hefty dash of wishful thinking), but have you ever found me to not take things to levels previously unknown?). I recently decided to try again, this time using a recipe I had long before the disastrous one, but completely forgot about. I added poppyseeds and gambled on using lemon extract, because have you seen the price of lemons lately? The result was–dare I say it–gorgeous. 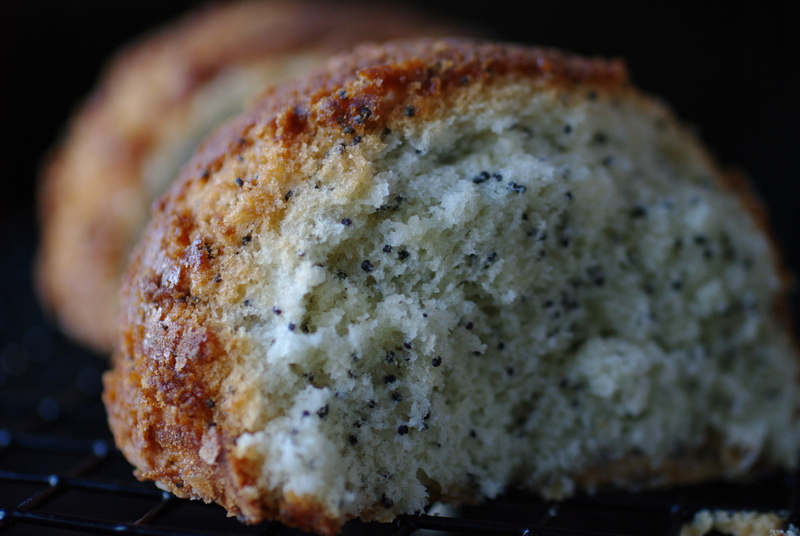 It was moist and light and I love the texture that the poppyseeds added. As a bonus, the lemon extract made it taste fresh with a slight tartness and lemon growers everywhere are going to have to survive without me from now on (and I’ve used bottled lemon juice as a replacement in other recipes and didn’t like the results. You purists out there can send me cash for real lemons, if you want). I didn’t add the berries this time, since they were out of season, but I’ve included the recipe below because it’s worth trying. As I put this cake together, I couldn’t be farther from where I was when I bit into that wedding cake in Ireland. I was a little lost then, a little disconnected from myself–nothing was quite working no matter how hard I tried and how true my intentions were. My failed attempt at my friend’s cake was how I’d been feeling for several months presented on a platter. It’d be unfair to stress out this new lemon poppyseed cake with the pressure I placed on the other one, but I won’t lie, the success of this cake makes me feel like maybe-just-possibly-let’s-keep-our-fingers-crossed I’m back. The fact that it was a recipe I had tucked away waiting for the right moment makes me think I was never really gone in the first place. Either way, it’s good to be home…. So the good thing about all of the gallivanting and country hopping and general revelry that’s been going on in my world is that I’ve gotten to spend a fair amount of time laughing and eating and drinking with some of my favorite people. The not-so-good part is that–even though I’m reluctant to admit it–I can’t recover from all the festivities as quickly as I did at the height of my gallivanting days. I mean, there was a time when four gin and tonics (FOUR, people!) was the baseline for a happy evening and I could roll into bed a mere 3 hours before I had to be up and at work with nary a thought of a hangover. Not so much, anymore… As my granny always said, youth is wasted on the young. These days, there’s talk of “pacing” ourselves or “should we really be doing this on a school night?” or “I have an 8am conference call; I gotta get some sleep.” I think the worst is “this is going to hurt in the morning.” Nothing quite kills the second (third?) round excitement like the idea that you’re going to suffer for having fun. I’ve always believed that coating your stomach (i.e., loading up on greasy foods) after a night of libations is definitely the way to combat feeling like death warmed over the next day. Hey, some people believe in aspirin and gatorade; I believe in bacon and eggs and maybe some hashbrowns. The problem is that the only diner within walking distance from me is closed on Sundays, which seems silly at best, heartless and cruel at worst. This means that after a Saturday night of living it up, I’m faced with a bowl of oatmeal from my own kitchen or a schlep to a fancy place near me when the last thing I want to do is get dolled up and pay upwards of $15 for overcooked bacon and undercooked eggs. Seriously a first world problem, I know, but I also know you’ve had the same debate, so let’s not judge, ok? 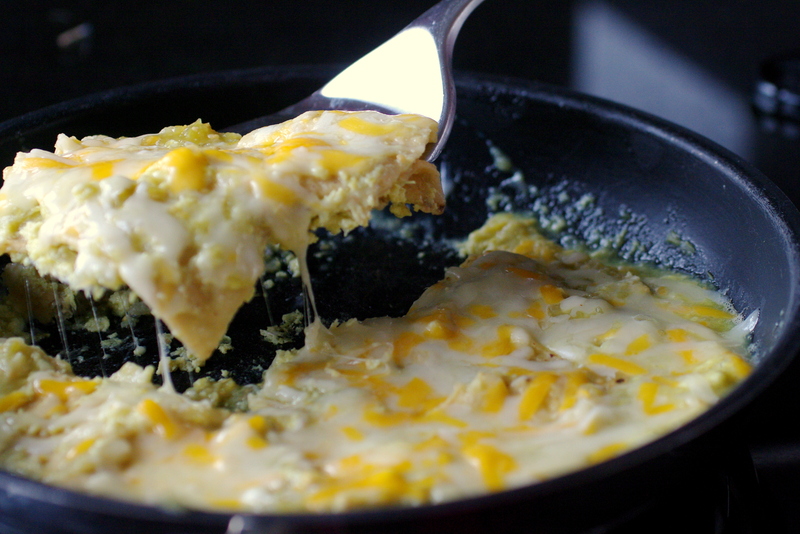 Pour the salsa verde in a medium frying pan. Just when it starts to bubble, stir in the beaten eggs. Cook and stir for about 5 seconds, until the egg feathers into the sauce, thickening and binding it. Immediately add the chips (enough to cover the bottom of the pan), tossing gently until they have absorbed enough sauce to become soft. Take care not to break the chips. Sprinkle the Jack cheese on top and let it melt. 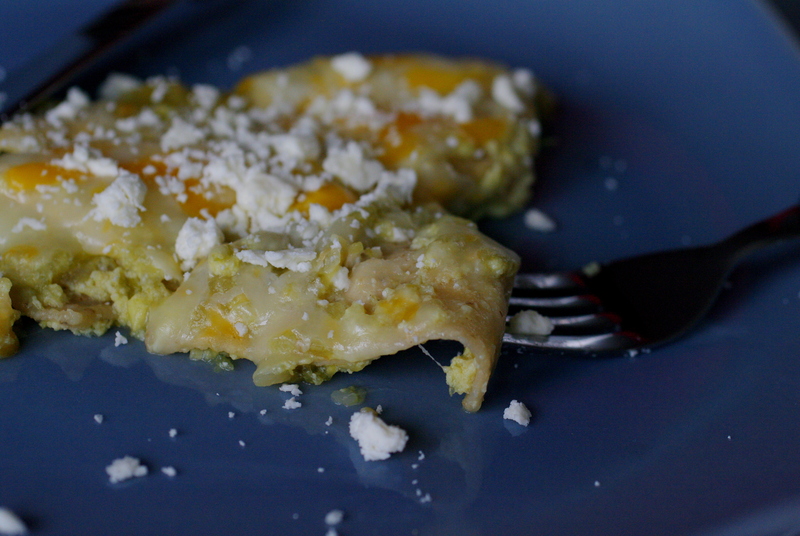 Divide the chilaquiles among 4 plates (or just eat it all yourself). Sprinkle with the feta and hot sauce, if desired. Serve immediately. Note: original recipe calls for chopped onion, cilantro and sour cream, which I’m sure all kick this up a bit, but (1) I forgot the onion and sour cream when I made this and (2) not a cilantro fan. But try it and let me know! Well then. Sometime toward the end of last year, I decided that 2011 would be the year of adventure. I am not a risk taker by nature, but I decided–somewhere between surviving a partial bike ride down the side of volcano and one too many cocktails–that I needed to do a bit more with life, because, well, this is the only chance I get at it. I’d read a book that was really terrible, but had one really good line in it about finding ways to say yes instead of reasons to say no. That resonated with me, because–being an essentially risk averse person (read: lawyer)–before the word “maybe” is out of my mouth, my mind has come up with 73 scenarios as to why something may not be a great idea. It’s pretty hard to jump on the adventure bandwagon when your go-to response is no, right? All this to say that I decided that I needed to change into more of a yes! that sounds fun!! person and so far this year, I’m doing a stellar job if I do say so myself (one good thing about being Type A is that when you set your mind to something, you’re always aiming for that gold star…). The upside is that since January, I’ve been to Morocco, NYC, Los Angeles, Monterey, Cozumel and just got back from Ireland last night (hello, jet lag!). Yeah, I don’t recognize myself either. The downside is that I was home for only one full week in April, much of which was spent looking for a fabulous fascinator, which dramatically cuts down on the cooking going on chez moi. I did manage, though, to whip up a wee dessert a couple of weekends ago, which I’m going to suggest you tuck away for those moments when time is not on your side but you need something decadent and impressive. I’ve wanted to make tiramisu since I took that culinary boot camp last fall and I vaguely remembered from the class that it was one of those things that could be put together quickly and left to its own devices before serving. That, and I had half a container of mascarpone left from my polenta adventure. Always helps when you have a main ingredient on hand. The one thing I did not have was the lady fingers and while my mind was swirling with visions of rum and cokes (I’d just gotten back from Cozumel) and rolling fields of heather (I had just bought my ticket to Ireland), I couldn’t for the life of me think where in all of the city of Chicago I could find them. I also didn’t have enough time to go here, there and everywhere looking for them, so I decided that I’d substitute another cookie. Lucky for me, I was standing in Trader Joe’s when I made that decision and decided to snag some ginger crisps and call it a day. Unlike my other experiments, this one actually worked! Shocking, I know. It couldn’t have been easier to put together (the recipe called for instant espresso, but I just used really strong coffee) and the crisps worked well after I decided to add several layers. I loved the spice that the ginger added to the recipe, and truth be told, I liked my version better than the traditional because I find that lady fingers can get a bit soggy and heavy, whereas the ginger crisps soaked up the mascarpone filling without becoming mushy. I’ve promised myself that I’m home for a good stretch now, and I’m looking forward to being back in the kitchen whipping up fun items, taking pictures and posting. What can I make for you? Combine water and 3 tablespoons of sugar in small saucepan and bring to a boil to melt sugar (I did this in a measuring cup in the microwave). Remove from heat and add espresso. Put mascarpone, sugar and vanilla in large bowl and beat with an electric mixer until smooth (I misread this and added the syrup (above). Really didn’t make a difference, but I suppose one should follow the directions?). Add heavy whipping cream and beat until mixture is thick and fluffy. 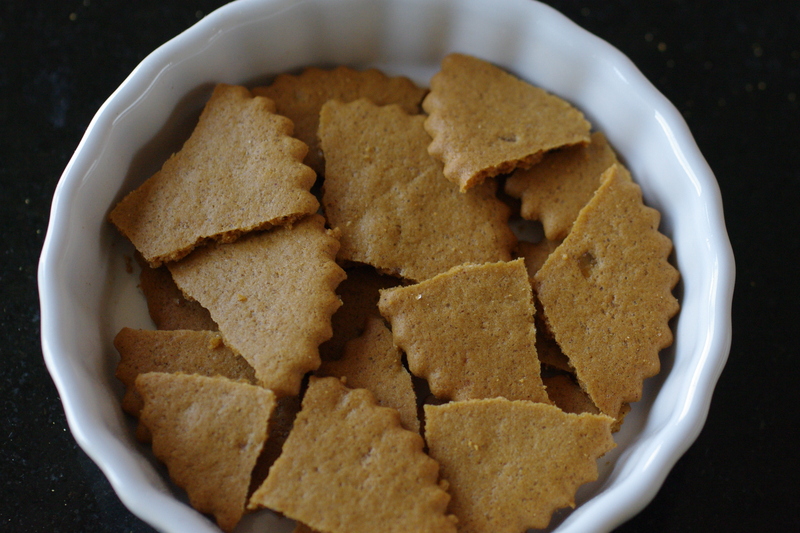 Break ginger crisps in half and add about 3 layers in the bottom of each ramekin. Add a couple of tablespoons of espresso syrup. 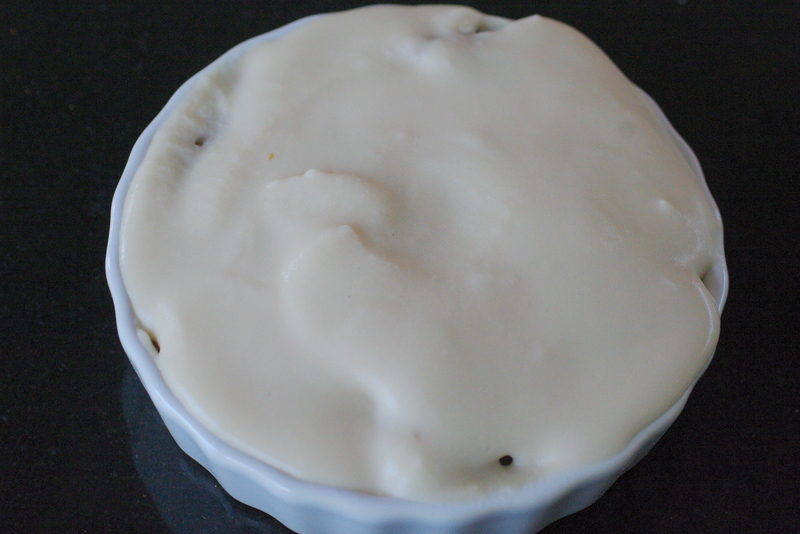 Spread half of the mascarpone mixture over top. 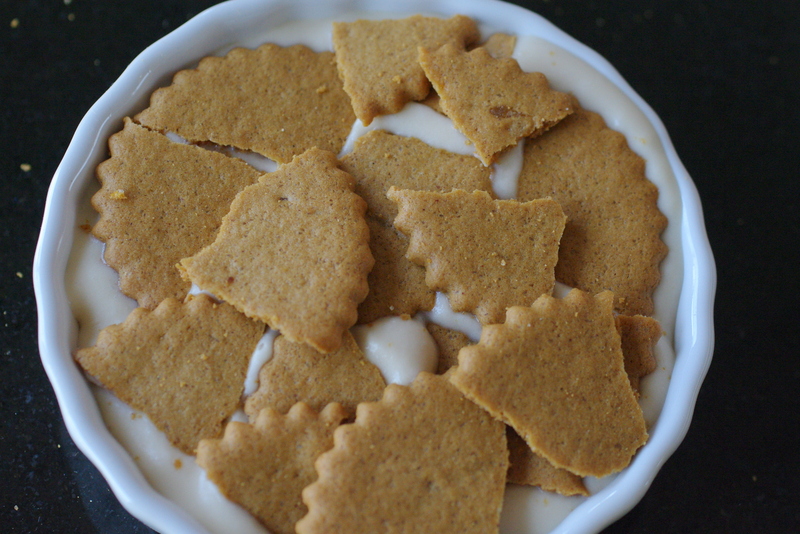 Continue with second layer of ginger crisps, syrup and mascarpone mixture. Chill for 1 hour (you can also do a day ahead). To say that I’m antsy is a huge understatement. I think most people would say that I have spring fever, but spring has not yet sprung in the Chi even though we are nigh on April, so that can’t be it. Or maybe it is. Maybe my internal body clock realizes that it’s [past] time to stop putting on 1746 layers just to leave the house to run an errand and my mind and soul are rebelling. Who knows? But, kids, I’m (as Blanche Devereaux would say), jumpier than a virgin at a prison rodeo (hi, Mom! Don’t pass out…). Like last week’s brownies experiment, I needed something that was so mind-numbingly rote that my brain would shut off and stop sending off flares that would eventually lead me to doing something totally inappropriate. I should pause here to say that when I get like this–when I get all bored and twitchy–I find myself getting into trouble. I tend to get impulsive just to have something to do or something different to think about. Rarely does this impulsiveness include practical things like organizing my closet or checking items off of my to-do list, because seriously, what fun would that be? Usually I can stop myself from doing truly detrimental things and narrow the field to a haircut or buying a few pairs of shoes, but sometimes I’m led down the path of rekindling so-not-good-for-me-relationships or quitting a job. True stories. We haven’t gotten nearly that far this time, so I’m hopeful that the thought of a trip to Cozumel in a few weeks will quiet my mind enough to keep me out of therapy. Or jail. Either way. So, yes, I had to come up with something to make that would occupy my mind for a bit, but that wasn’t so complicated that I wouldn’t do it. 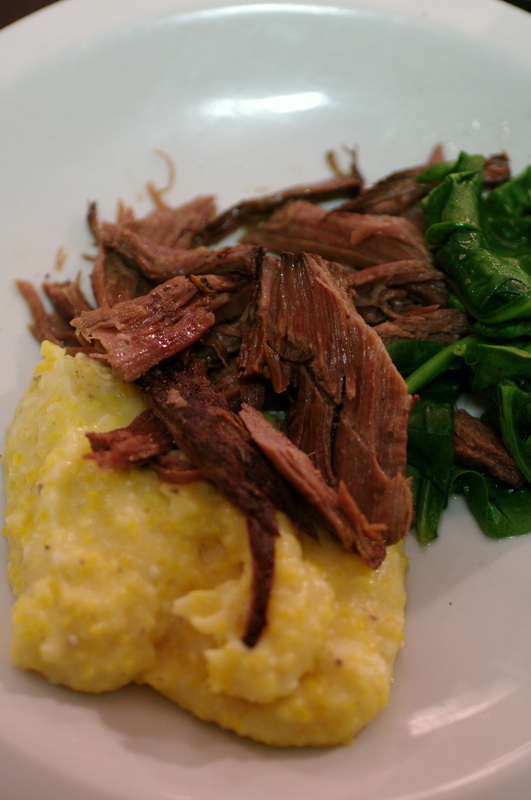 I decided on polenta, because I hadn’t had success with it in the past, so there was a good challenge involved and it only has a few ingredients, so I wouldn’t get discouraged. A friend mentioned that she’d made polenta using cream cheese, and my mind instantly went to mascarpone, because it has just about the same consistency but is much more yummy. 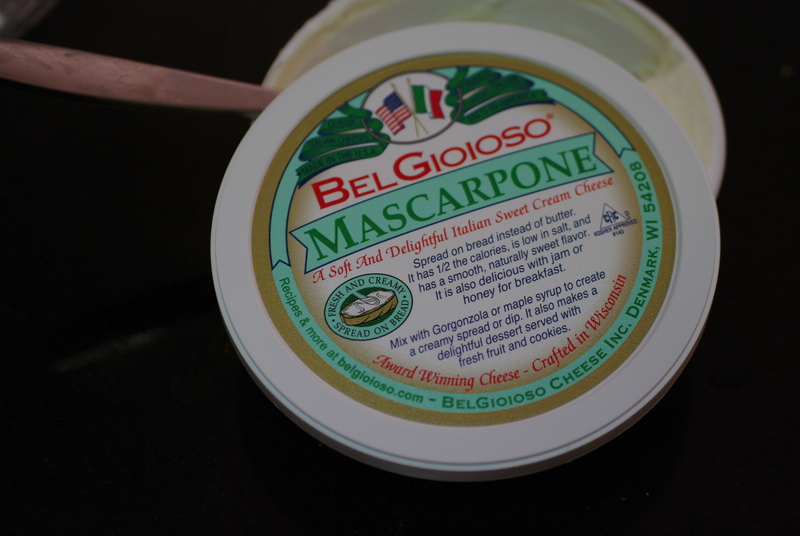 Plus I’ve always wanted to use mascarpone in something, because it sounds so fancy. 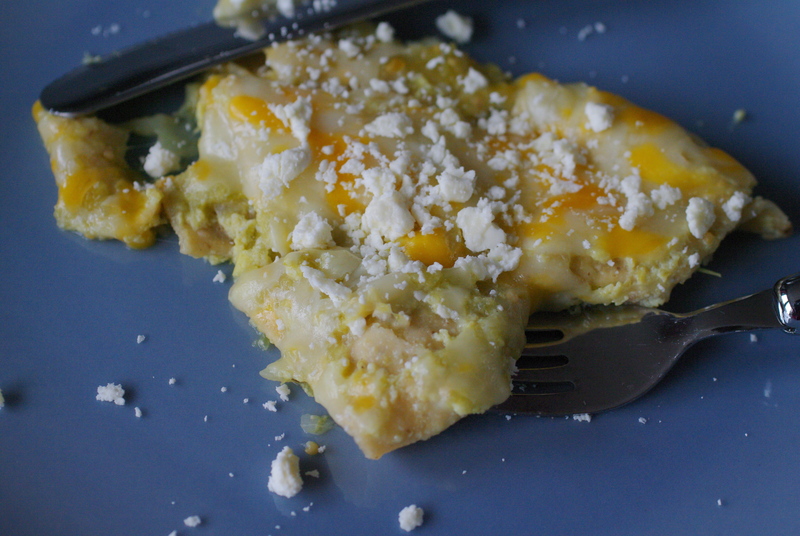 I mean, would you be reading this post if it were called Polenta with Philly Cream Cheese? Methinks not. Honestly, it couldn’t have been easier. A total of 5 ingredients (water, cornmeal, salt, sugar and mascarpone) and 30 minutes later I had a side dish that I had to stop myself from devouring like it was my job. It was also perfect, because it required a fair amount of watching and stirring, and I learned that if you stare at a swirling mass of cornmeal long enough, your mind really will shut off (to the point that the timer may go off for a good minute before you realize it’s yours). Mission accomplished! The polenta was creamy and slightly sweet from the mascarpone. It tasted ridiculously decadent, and even though I just served it with slow cooked beef I did in the crockpot and steamed spinach, I could easily see this making it to dinner party plates. 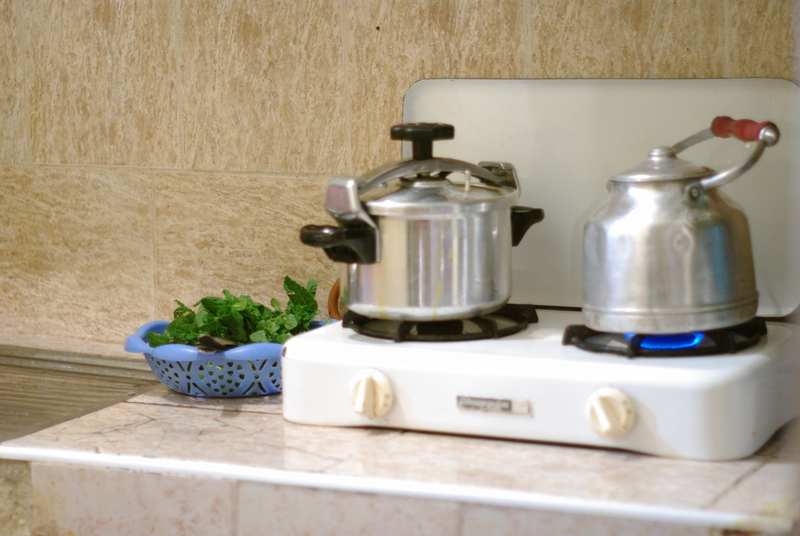 Bring 5 cups water to boil in heavy large saucepan over high heat. 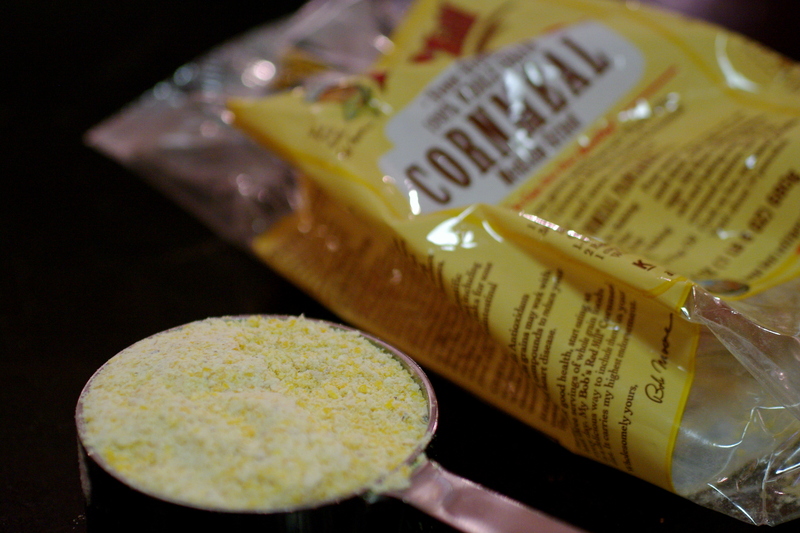 Gradually whisk in polenta, then 1 1/2 teaspoons coarse salt and sugar. Reduce heat to medium-low; simmer until polenta is tender, thick, and creamy, whisking often and adjusting heat to maintain gentle simmer, 25 to 30 minutes (I would say that it took about 35 minutes to get it relatively smooth and thick). Mix in mascarpone cheese. Season polenta to taste with salt and pepper. Do you ever have one of those moments when you realize that it is very possible that you are someone else’s crazy? Like, when you have to dig deep and say, “Self, you are about to become the punchline in someone’s ‘Oh my god, I used to know this crazy girl who…’ story if you don’t stop acting so, well, crazy.” ? I was (am?) there yesterday. I asked someone a question that as the words were coming out of my mouth, the logical, non-Sybil side of me was screaming, “STOP TALKING!!! STOP. TALKING. RIGHT. NOW! !” but it was out and there was nothing I could do but own it and try to move on. Yikes. What this has to do with food is really nothing other than I decided to bake some brownies to occupy my mind (because I’ve never made brownies from scratch before so I thought it would be a good project) and try to bring myself back to a place that’s a little more Zen and a little less whirling dervish. Baking has a calming effect on me mainly because I have to concentrate on measuring ingredients out and setting up bowls and not overmixing or underbaking and it’s hard to think about random acts of nuttiness as you are trying to get egg whites to reach a perfect peak. 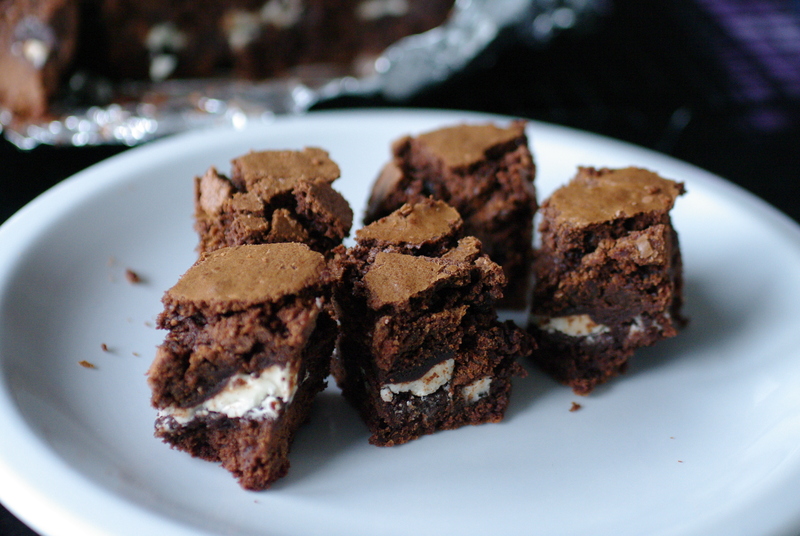 For a very long time I’ve wanted to make brownies with Peppermint Patties in them because I love brownies and I love Peppermint Patties and so, why not? 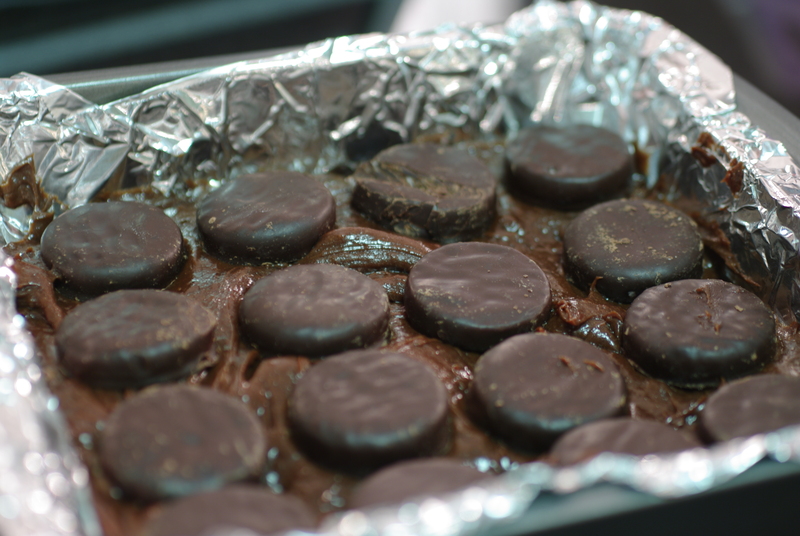 I realized that putting them at the bottom of the pan would likely not be a good idea, so I decided to do a layer of brownie batter followed by a layer of Peppermint Patties and then topped by a layer of batter. Keep in mind that I was watching the end of Kings of Pastry while I was thinking about this, so inspiration was running high. It’s doing this–making up recipes–that makes me realize that I really have no idea what I’m doing in a kitchen, despite having taken classes and made my way through boot camp. So when the original recipe called for 2 cups of sugar, I had to pause and try to figure out how to account for the fact that I was adding Peppermint Patties to the mix. And then would that change the consistency of the brownies? And would the middle of the patties melt and harden and become inedible? And should I cut back on the chocolate? AND……! And before you knew it, I’d forgotten all about my moment of crazy the day before since I had now spiralled down into an abyss of culinary kookiness. But unlike my other bout of WTF?, I was the only witness and could easily conceal all evidence if need be. 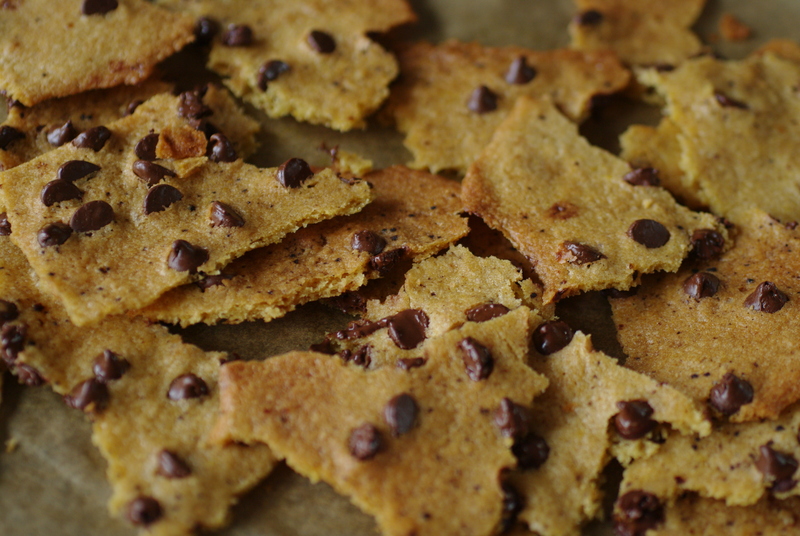 After a bit of tweaking and doubling the baking time, I have to admit to being pretty happy with my experiment. They’re a little crisper on top than I’d normally like, but the center is moist and fudgy and I cut them so there’s a Peppermint Patty in each square. 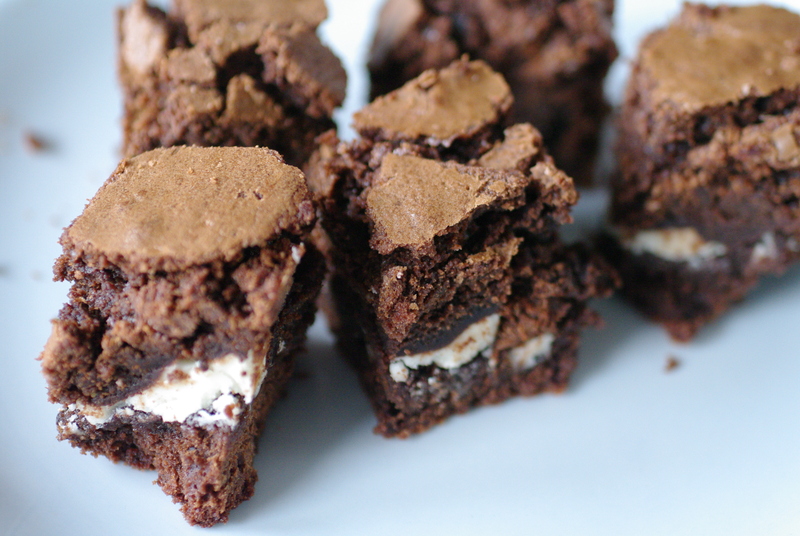 The sides (which are usually my fave part of a brownie) were much too crunchy, so I had to cut them off. I’m not sure if that had to do with lining the pan with foil or that I had to bake much longer than recommended (I think the suggested pan size is too small). But the absolute best part is that I was completely distracted, which is exactly what I wanted (more than I wanted a whole pan of warm brownies, which says a lot). I feel better, I can think back on what was said without cringing and calm has returned to my world. But…there’s one lingering thing nagging at me. If being in a kitchen can make me this happy so quickly, what the *$)#%& am I doing sitting in an office all day….? Hi! Remember me? The last time I posted, I so did not think it would be this long until I came back with some sort of goodness for you. Will you forgive me if I tell you that part of the reason for the long absence is because I was in Morocco riding camels and visiting centuries old buildings and shopping in souks and eating in places more beautiful than I’ve ever seen and visiting caves where people actually lived (with satellite dishes nonetheless) and did I mention riding camels? Y’all for real, I was in Morocco!!!! I still can’t believe it, but luckily I have 800+ pictures to prove it. So I’m back and settling into real life has been a lot harder than I thought it would be. I mean, after you’ve stayed in the same hotel as the Moroccan men’s soccer team (oy…!) 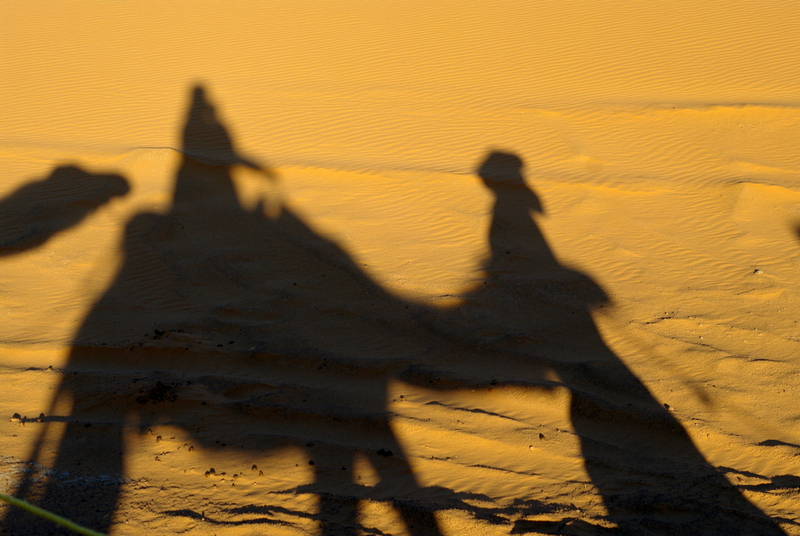 and sat in the Sahara watching the sun set, it’s kind of hard to focus on the day to day of everyday life. But, I’ve missed being here and I’m hoping there are still a few of you out there…. Anyhoo. 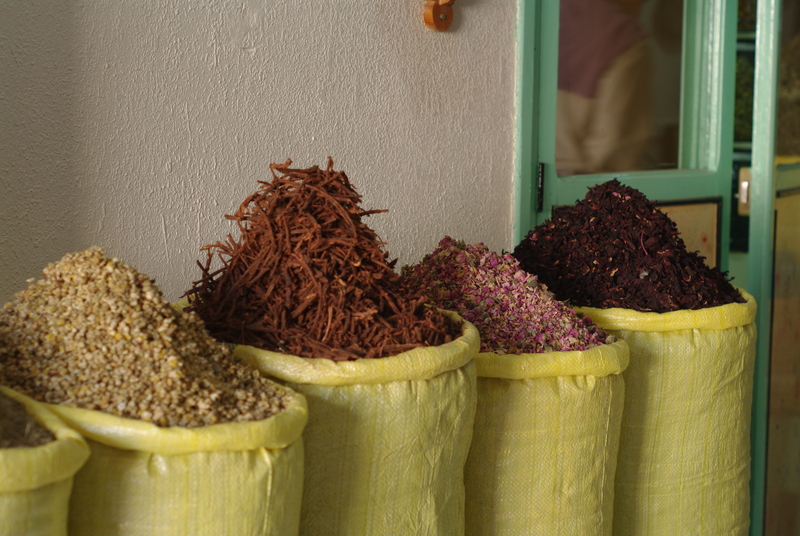 Luckily this trip was full of food finds (tagines anyone?) and I have a decadent dessert in store for you as soon as I can find some gum Arabic (if you happen to have a hook up to that, let me know). What I loved most about the trip is that there was a story behind just about everything we saw or did (or ate) and it made me realize how very young the U.S. is. That’s not to say that each family doesn’t have its own history and its own tales, but on the whole, it’s pretty hard to have a stellar story behind your morning venti-no foam-double shot-vanilla-soy-latte, you know? Most of our days are spent moving forward with just a passing glance to the past, whereas I felt in Morocco that the past was essential to shaping the future. It felt as though that without a strong acknowledgment of what had come before, there’d be little reason (or way) to move ahead. If one generation wasn’t passing on a story or a tradition to another, what would be left? And how could you learn from the triumphs and failures? Of course, the world is changing faster than it ever has before and the Morocco I learned about in February is completely different from the Morocco today, politics-wise. We all know that this has the ability to change society in drastic ways, for better or worse. But for now, it is a country and culture very much tied to traditions, and I’m beyond words grateful to have gotten to experience it. 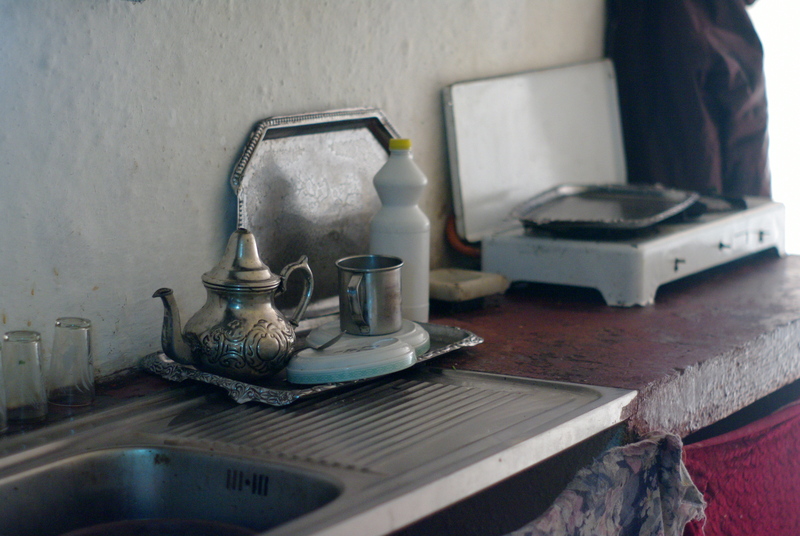 We arrived in Casablanca and headed straight to Rabat, the capital. On the way, we stopped at what was basically a truck stop for tea. Now, I did not grow up taking road trips, but I’ve stopped at a few Midwestern oases and these are not the types of places that you expect to get anything with a sell-by date that begins with 20__, let alone tea made with fresh sprigs of mint. But we did! I don’t know if it was the novelty of it or the cold or the lack of sleep, but that glass of tea was one of the best things I’ve ever tasted in life. It was super sweet and so hot that I stayed warm long after we were back on the road. 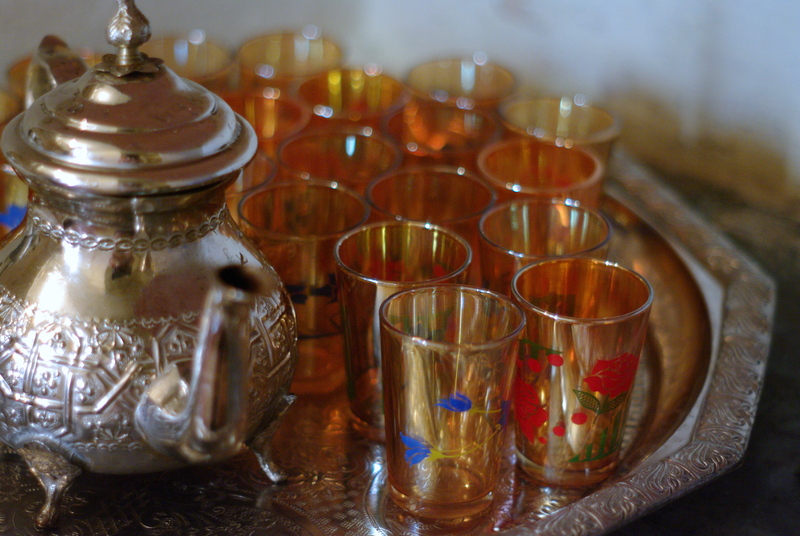 Later that night, we went to dinner in Rabat, and our meal ended (as did all of our other meals) with mint tea. This time rather than being at a truck stop, we were in a stunning restaurant with 20 foot ceilings and low sofas covered in red and gold. 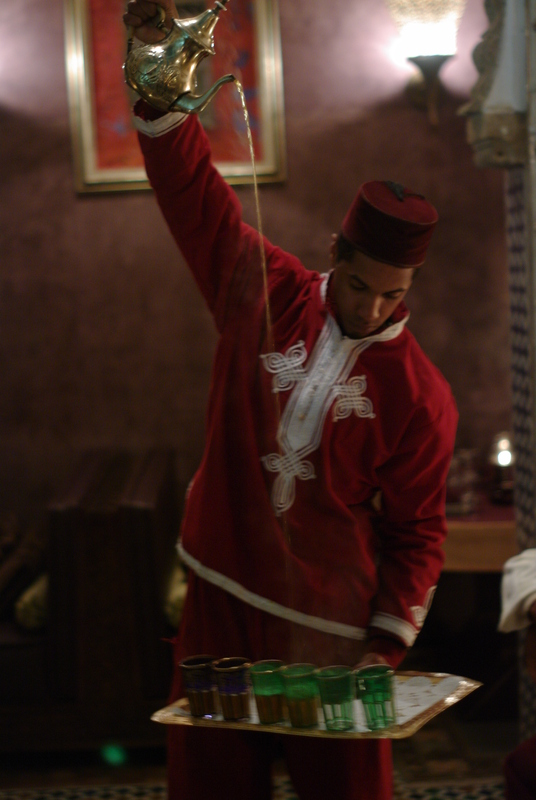 And rather than a server coming to pour us tea, a man came out carrying a tray of 10 glasses and poured tea from at least 4 feet above them (I dare you to try that next time you have guests!). 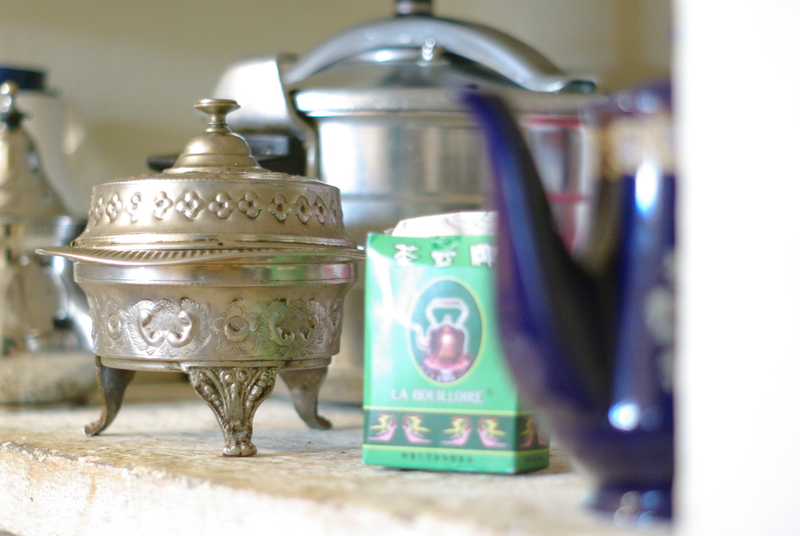 It wasn’t until a few days later when we went to a village in the Mid Atlas mountains that we got the full tea ceremony story. We visited a village where the women were doing their laundry in a stream while the kids hung out at the internet cafe. There was the official town guide who welcomed tours into his cave dwelling that he proudly announced had housed all of his many children and some of their families and it was only recently that they’d put in the upstairs (although the satellite dish had come years earlier). We were told that inviting people to tea is a way of not only showing hospitality, but of showing how much you care for the person. So if you’re invited to tea and it’s already made, it means that the host doesn’t really want you to stay that long (which really means they aren’t that excited about you). On the other hand, if the entire tea process is done while you’re there–and if done right, it can take awhile–then they are happy to have you and want you to stay. I have no idea, but I imagine that there’s no rushing off from a tea invite, either. Needless to say, our host started the tea process after we were all seated and he had told us a few stories about his village. His wife didn’t even put water in the pot until we had been there a bit. After it boiled, he told us the process step by step: first you wash out the pot with boiling water. Black tea is then added to the pot, hot water is poured over it to wash it off and then that water is cast aside. The mint and sugar (about 6 tablespoons for a pot) are added to the tea and more hot water is poured in. You let that steep for a bit while the glasses are set up. Finally, each cup is poured to the same level in the glass (so as not to offend anyone). Can you think of anything you’ve done with that much care lately? I admit that somewhere during the two weeks I started to take the mint tea at the end of the meal for granted and to be perfectly honest, I would have paid a hefty price for an espresso at one point. And then, as fast as it had happened that I got to go on this trip, it was over and I was standing in the duty free at the airport in Casablanca spending my last Dirhams. Of course, after such an amazing trip, I feel changed for the better and have grand ideas about how I’ll spend my time and live my life in a more conscious, slower way. My hope is that I’ll have people over and start my tea process after they’ve settled in and we’ve chatted and caught up and have nothing but time and stories ahead of us. But, I bought as many boxes of packaged mint tea as I could fit into my carry-on, just in case…. Boil at least a liter of water. Rinse a small tea pot with about 1/4 cup of the water. Add the tea leaves and another 1/4 cup boiling water. Swirl the pot to wash and rinse the leaves, and pour out the water. 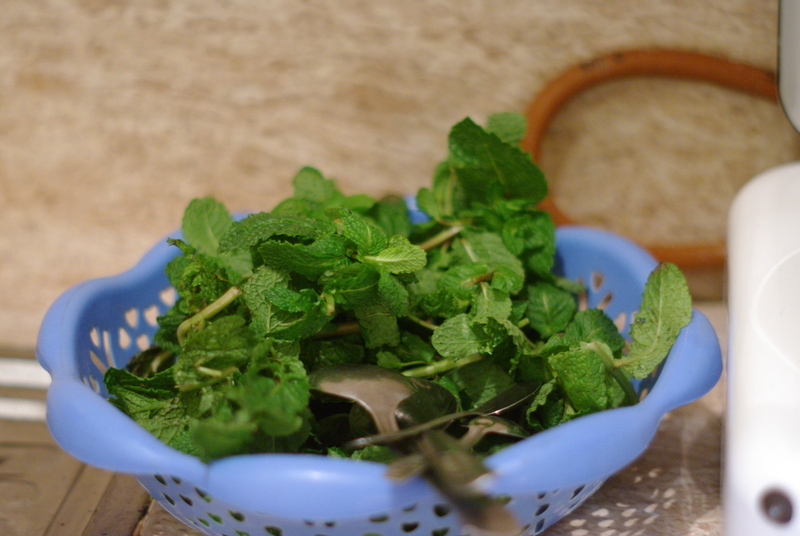 Add the mint leaves and the sugar, and fill the pot with 1/2 liter (about 2 cups) boiling water. Leave the tea to steep for five minutes or longer, or set the tea pot over medium-low heat and bring the tea to a simmer. Remove from the heat, and allow to steep several minutes more. Gently stir the tea, pour into small tea glasses and serve. I always think that the worst part about the holidays being over, other than my credit card statement, is that the treats just end. And there’s no weaning period, either. You leave work in December slightly overwhelmed by the chocolate and candy on every desk and come back in January and there is nary a goody to be found. Not even a Lifesaver or a broken candy cane. 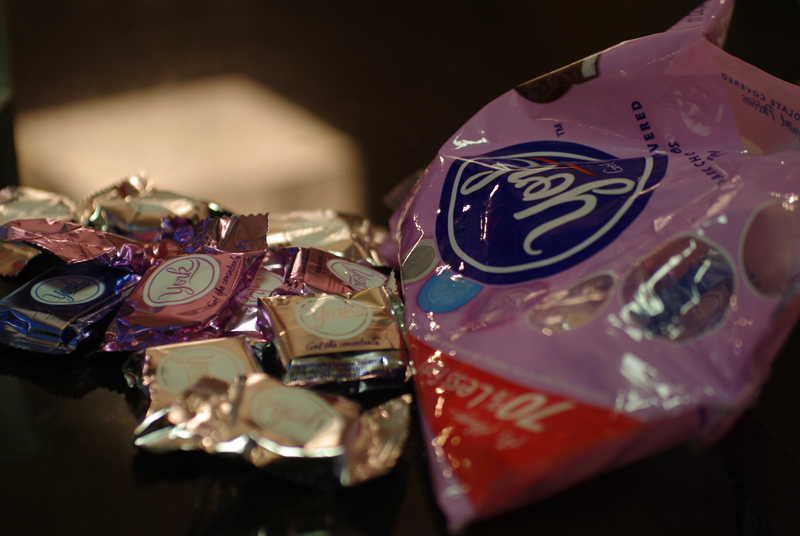 After being on a sugar high since Halloween, it’s kind of harsh to give up the sweets so suddenly. And it adds to the winter blahs, too, no? I’d planned to whip up another Hawaiian treat for you so you’d forget that the forecast is cold, followed by frigid and rounded out with a little dear-lord-I-think-the-inside-of-my-nose-has-frozen for the next 7 weeks, but I was craving something comforting and chocolate laden and not too terribly bad for me (as hard as it is to imagine, that combination does exist!) to ease me into the new year. Luckily, one of Santa’s elves delivered these crisps in my stocking and it took every ounce of self-control I had not to eat the whole bag in one sitting. Twenty minutes later I said to myself, “Self, it is Christmas and you have suffered in overheated stores and ruined new boots in the snow in order to spread holiday cheer to others, so if eating an entire large Ziploc bag of crisps would warm your soul, go for it.” And so I did. With a glass of milk that may or may not have had a shot of Kahlua in it. Why do I admit these things to you?! Preheat oven to 350°F with rack in middle. Line a large baking sheet with parchment. 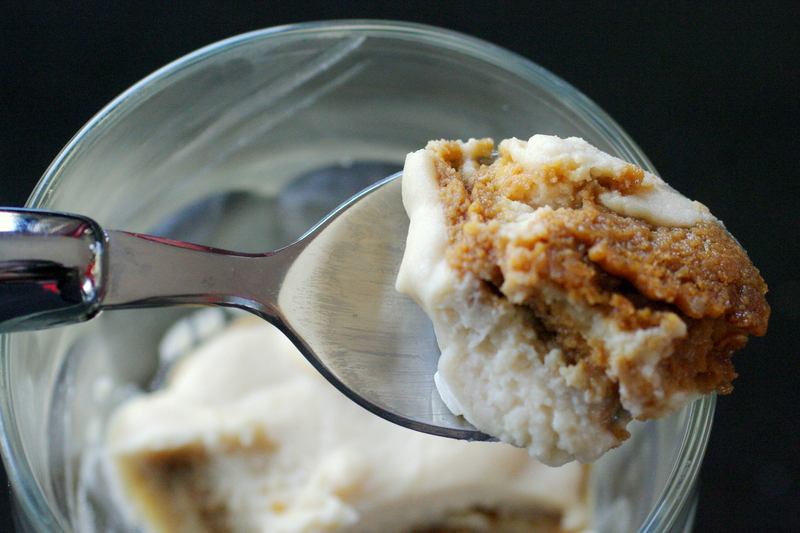 Blend butter, brown sugar, flour, vanilla, salt, curry powder, and egg white in a food processor until smooth. Glue parchment down with a dab of batter in each corner, then spread remaining batter evenly into a 14- by 10-inch rectangle (1/8-inch-thick) on parchment with spatula. Scatter chocolate and nuts evenly over batter, then bake until firm and golden-brown, 18 to 20 minutes. Transfer, still on parchment, to a rack to cool completely. Remove from paper, breaking into pieces. Although my astrological sign (Cancer) would tell you otherwise, I don’t have much desire come New Year’s Eve to make lists of all that’s been accomplished this year and things that still need to get done in the next or generally reflect on the past 364 days. By this time of year, I’m more than ready to get started on a new path with new adventures. I tell you this because I’d thought about doing a round up of all things food as we head into 2011, but I’d much rather think about what you’re doing on NYE and all the yummy things we have to look forward to in the coming year. Mercadito is also doing a 5 course menu with an open bar option. This is one of my favorites for always good, always fresh and always fun Mexican. Cafe des Architectes will let you celebrate in grand style by adding black truffles to your entrée. Go ahead! You deserve it. 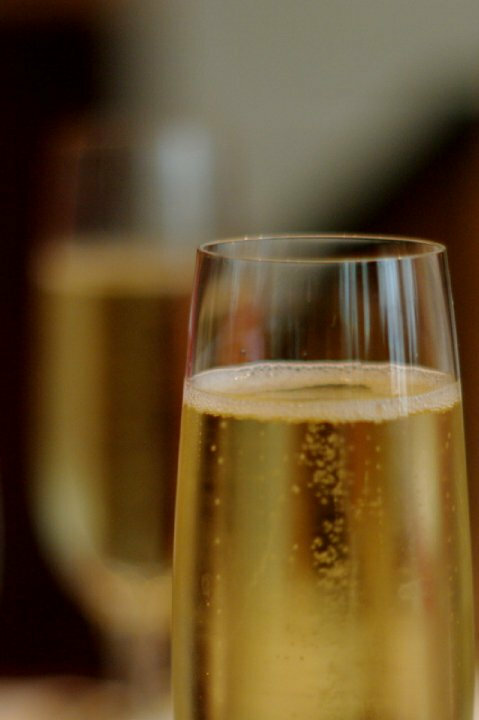 Recently reopened Avec is throwing their hat into the 5 course NYE ring and has an optional wine pairing in case you don’t want to have to figure that out on your own. As one of the best communal table places in the city, you may meet your 2011 crush while feasting on pork belly cassoulet. I’ve never had a bad meal or a boring time at Carnivale, which on top of Caribbean inspired food will have samba dancers and other live entertainment. Really, can you go wrong with that? After you have dinner at Cafe des Architectes, head to Le Bar which is located on the other side of the Sofitel. It’s one of my favorites for its cozy atmosphere (fire place included! ), St. Germain inspired cocktails and lovely park view. Sable Kitchen & Bar (which provided the delish treats and liquor laced cocktails for my birthday this year) is going retro with a 1940s theme party, complete with small plates, desserts and champagne. Only a few tickets are left for Lumen’s Vintage Vegas Party, so get moving (procrastination is sooo 2010!). I’ve had many a fun night at this swanky and sophisticated club, including birthday ’09. Eatt’s menu reads like the comfort food lover’s dream: corn beef hash and eggs, sausage, bacon and ham skillet (yes, that’s all in one dish!) and Dutch apple pancakes. Go even if you aren’t hung over. The Bongo Room is a no-brainer. Just say yes to chocolate tower french toast, smoked duck breast Benedict or (and?) pumpkin spice pancakes. If you can’t get to breakfast, let breakfast come to you. Grub Hub offers delivery from hundreds of restaurants that usually don’t deliver. I am wishing you all health, happiness, laughter, love and joy in 2011! Celebrate well and see you next year! Just a note from your friendly lawyer by day, food blogger by night to say that all of my recommendations above are purely based on my own independent non-NYE visits to these places (except Grub Hub, which I’ve never used) and while I can’t guarantee that they’ll wow you like they did me, I really hope they do. Obviously let me know if you go and what you think. Find Me Something to Cook! I'm craving a good recipe! This work is licensed under a Creative Commons Attribution-No Derivative Works 3.0 United States License. Basically, don't steal the text or pictures. It's not nice and your mom taught you better. Plus there's that whole karma thing.